According to a new market research report titled ‘Extreme Ultraviolet Lithography Market – Global Industry Analysis, Size, Share, Growth, Trends, and Forecast, 2018–2026,’ published by Transparency Market Research, the global extreme ultraviolet lithography market is expected to reach value of US$ 3,807.5 Mn by 2026, expanding at a CAGR of 26.8% from 2018 to 2026. According to the report, the global market is expected to be influenced by a range of macroeconomic and market-specific factors during the forecast period. In terms of demand, Asia Pacific is projected to lead the global market, with the market in the region expanding at a CAGR of 28.6% between 2018 and 2026. Advancements in the miniaturization of electronic devices and reduced number of masking layers are anticipated to significantly drive the market during the forecast period. The global extreme ultraviolet lithography is projected to expand at a significant growth rate during the forecast period, due to growing adoption of miniaturization and sophistication of electronic circuit devices. The cutting-edge EUV lithography system enables customers to manufacture smaller, more rapid, and more powerful chips, giving rise to the demand for extreme ultraviolet lithography. Also, the conventional argon fluoride (ArF) immersion technology requires expensive multi-patterning mask sets. This technology needs up to four masks to create a silicon wafer layer, while the EUV lithography technology requires only a single mask to create the layer. This factor is likely to augment the extreme ultraviolet lithography market in the next few years. The global extreme ultraviolet lithography market has been broadly segmented based on light source, end-use, and region. In terms of light source, the market has been segmented into laser-produced plasma, gas discharge, and vacuum sparks. Among these, the laser-produced plasma segment holds a significant share of the market. The segment is anticipated to expand at a CAGR of 27.4% during the forecast period. Based on end-use, the global extreme ultraviolet lithography market has been classified into memory, foundry, and integrated device manufacturers (IDMs). Among these, the memory segment held a prominent i.e. 46.9% share of the global market in 2017, followed by the foundry segment. 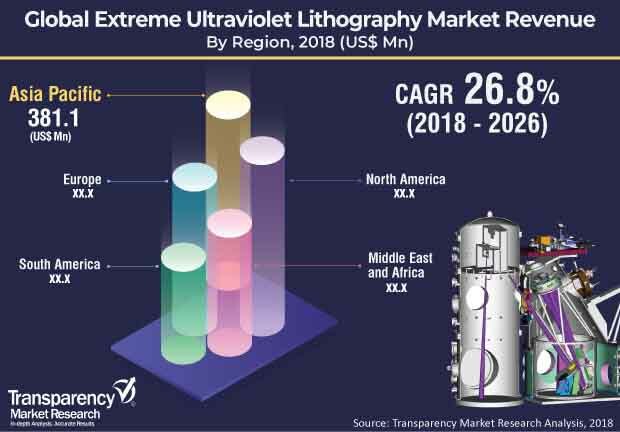 In terms of region, the global extreme ultraviolet lithography market has been segmented into North America, Europe, Asia Pacific, Middle East & Africa, and South America. In terms of revenue, Asia Pacific held a leading share of the global market in 2017. The market in the region is anticipated to expand at a CAGR of 28.6% during the forecast period. Presence of a large number of semiconductor companies in the region has led to rise in the adoption of extreme ultraviolet lithography in Asia Pacific. In terms of revenue, South Korea holds a major share of the extreme ultraviolet lithography market in Asia Pacific, due to high usage of semiconductor devices such as memories in the country. The country is followed by Taiwan. Moreover, in terms of revenue, the market in Japan is anticipated to expand at a significant CAGR during the forecast period, due to growing semiconductor industry in the country. The research study includes profiles of leading companies operating in the global extreme ultraviolet lithography market. Market players have been profiled in terms of attributes such as company overview, financial overview, business strategies, and recent developments. Currently, only one player i.e. ASML Holding N.V. operates in the global EUVL market. However, in the next few years, companies such as Intel Corporation, Samsung Electronics Co., Ltd., Taiwan Semiconductor Manufacturing Company Limited (TSMC), Canon, Inc., Nikon Corporation, and Carl Zeiss AG are expected to invest in the market.